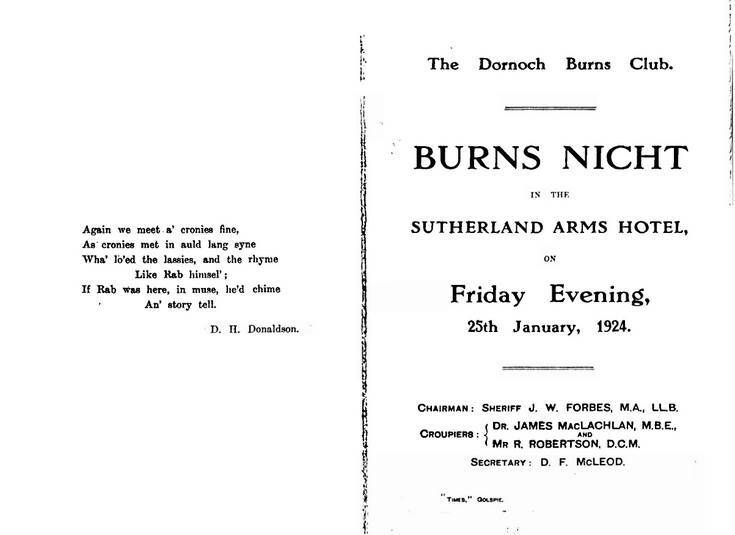 Dornoch Historylinks Image Library - Burns night 1924 report. A copy of a newspaper article entitled Dornoch's Nicht Wi' Burns, January 25th 1924. The article describes the occasion in detail and included in the copy is the menu and toast list of the function held in the Sutherland Arms hotel (Dornoch).Some of the dignitaries include Sherriff J W Forbes, Dr James MacLachlan and Mr R. Robertson. The toast list contains many other names of those others attending and participating. There is an A3 copy of the article and two copies on A4.